There seem to be so many ways now to learn how to make stuff–"real life" crafting and sewing classes at local and chain shops, YouTube videos you can go to for a quick visual primer on specific techniques, sewalongs hosted on blogs, and now a more recent development that we're watching with great interest here at Spoonflower–websites that offer crafting and sewing classes for a small fee taught by people who really know their stuff. Classes on sites like Craftsy and Creativebug tend to be much more affordable than traditional in-person classes, potentially more reliable than content you might dig up yourself on YouTube, and of course, still pause-able and rewind-able should you miss something or need to see something done over again–and again. Creativebug is the newest player on the online crafting class scene, and we're thrilled to be offering a 3-month Creativebug subscription for today's giveaway! This subscription will get you 3-months' worth of unlimited access to classes taught by the likes of Heather Ross, Liesl Gibson, Natalie Chanin, Anna Maria Horner, and Cal Patch–and those are just some of the sewing instructors. Other instructors teach classes on bookbinding, ceramics, needle-felting, and many other categories, so you're sure to learn plenty about your favorite crafty subjects from some of the most talented and experienced people out there. To enter today's giveaway, just leave your comment below or on the corresponding Facebook post and tell us which class or instructor on Creativebug you find most exciting. 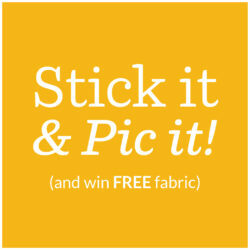 Don't forget to include your Spoonflower screen name or some other means of contacting you in case you're our winner. Entries close next Tuesday, 9/18 and we'll announce a winner–and a special offer from Creativebug!–next Wednesday, 9/19. Good luck, everyone! 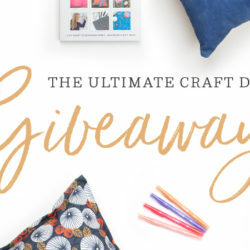 Last week we were giving away a copy of Gretchen Hirsch's new book, Gertie's Book for Better Sewing, and the winner was Spoonflower community member Ariel Shogren. 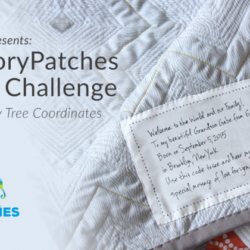 We also held an impromptu–and brief–giveaway on the blog yesterday for our Northeastern US peeps for two tickets to the non-profit Quilt Alliance's second annual Quilters Take Manhattan event coming up this Saturday, 9/15 in NYC. Laura Alvarez won those tickets today, so congrats to both Ariel and Laura! I love Anna Maria and Liesl Gibson and would love to take their Creativebug courses! That sounds like a fabulous giveaway… thanks!! This would be perfect for me as I live in the middle of nowhere! Thanks for having this Giveaway. I like the talisman necklace class taught by Alex Bluh! I love Anna Maria Horner! I have enjoyed making items from her book Handmade Beginnings so I am sure I’d like a class instructed by her. I like the Girl’s Bloomers by Improv Sewing. What a great giveaway. Sounds like lots of fun. I like the Mishima class! I’ve heard great things about this and I’d love to learn more from Cal Patch! What an awesome giveaway! There are so many that I would watch. ~ Andrea B.
I would love to take the Bust Adjustment class. I can never get a pattern quite right. What a great giveaway! Count me in please! Tough choice, but I think I’d like to take the linen caftan class with Liesl Gibson. What a great idea & site! I would love to take the needle felted peeps. They are so cute!!! I would love to take the Birds of a Feather Maxi class with Anna Maria Horner – beautiful! Um, Heather Ross of course! I love that she is so talented in so many different mediums. I would love to take one of her classes. How fabulous. It’s a hard excision but I love Heather Ross. Have tons of her fabric. I would love to do the Anna Maria Horner classes! What a great new site! april (dot) chase at gmail (dot) com. Ooooohhhhh….Anna Maria Horner! She makes delicious prints! This would be lovely! You had me at Anna Maria Horner, but even at closer inspection there are so many classes I could see taking… like something to make clothing or clothing patterns. Thanks for the chance! I enjoy arts, crafts, mixed media, collage, painting, drawing and sewing the best! what a great gift giveaway! I ADORE NATALIE CHANIN! Her work is such and inspiration to me not only because of her creativity but also what she has done for women in her community and all over the world! Heather Ross! Would love to take her class! Wow- I had never heard of Creativebug! Thank you for introducing me. I am fabric challenged so I’m looking forward to learning to do more with fabric. All the classes look great- Liesl Gibson’s Linen Caftan class just caught my eye tho! Oh this would be a dream come true! Thanks for the opportunity spoonflower. Thank you for the giveaway! All the teachers are inspiring, but I’d be most excited to take one of Natalie Chanin’s classes. How wonderful! Screen printing or collage workshop looks like great fun. All of the printmaking classes look so great, but I would have to say “Intro to Screen Printing: Tracing Paper Stencils” would be my starting point. Then, on to 2-color screen printing! I agree! So many awesome things I would want to take! For some reason Jody Alexander’s bookbinding classes are speaking to me today, but I would also love to take Debbie Stoller’s Easy Cable Knitting class and the Birds of a Feather Maxi and . . . clearly I will just have to pay for a subscription if I don’t win! I’d like to take something from Liesl Gibson! Too many choices! What an innovative idea! Great site….can’t wait to take a class from Natalie Chanin! I’m most excited about the Sewing Workshop. I can’t think of anything else that would fulfill my need to interact with others and to update as well as update my current skills. I’ve lived in France going on 11 years and haven’t taken any tutoral on anything else except language. This is definately an opportunity which I would make the most of. I want to take all of Natalie’s classes. Bring on that free subscription! Rebecca Ringquist! That embroidery looks phenomenal! OH! I would love to take Anna Marie Horner’s Birds of a feather maxi skirt class!! I’d like to take a class with Heather Ross. Her jumpsuit project looks like an outfit I just bought in Greece which I practically live in!